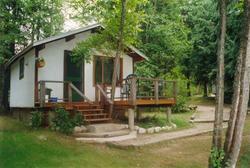 Karibu Park is a quiet, picturesque hideaway situated just above the Slocan River in Winlaw. We have eight comfortable cottages and 20 large, private campsites on 14 acres (6 ha) within a few minutes’ walk of the village. We are centrally located, 40 minutes’ drive from Nelson, Castlegar or New Denver. If you love nature, but also appreciate the creature comforts, then you will feel right at home, here! Our cottages are fully equipped with modern amenities. Each has a full kitchenette, bathroom, and excellent queen or double bed, plus a sofa bed or second bed, TV and VCR. We have movies for rent at the office. The campground is situated in a separate area, and has spacious, treed sites. We are open year-round for cottage accommodation; camping spring to fall. Pets are welcome, on approval, for a fee. The cottages overlook a landscaped recreation area, where we have a large gazebo, badminton, volleyball, barbeques, fire pit, playground and more. We have a small beach area on the river, and are close to other beaches and nature park. We have a hot tub, sauna and massage room. You can be as active or as relaxed as you want to be! Your hosts Christine and Brian welcome you!